About Us — P.S. Equities, Inc.
P. S. Equities, Inc. specializes in developing high-quality multifamily housing and commercial projects which enhance the communities they are located in. With over 30 years in the housing industry, we have developed more than 40 projects, more than 2,300 units, in Michigan. The P.S. Equities team is deeply involved in every step of the development process, beginning with site selection. As the old adage goes in real estate, the most important part of a good real estate investment is ‘location, location, location.’ Our team firmly believes this to be true – it is critical to select the best site for the housing development so it really enhances the surrounding neighborhoods. We work with the local community as the project moves through the various aspects of local government approvals (site plan, zoning, permits) to ensure we hear the concerns of the community and design the project appropriately. We actively participate with the architect and the general contractor during the design and construction phases to ensure a quality product is delivered. We are not just putting up a building – we are creating someone’s future home. Historically, we have maintained an ownership interest in the properties we develop – we are engaged owners who want to be good neighbors. We work with professional property management companies to ensure the properties operate smoothly and are well maintained. We have now been in business long enough that many of our originally developed properties have reached the end of their initial debt and equity life-cycles and we have been strategically re-positioning properties to ensure a quality housing development is maintained for years to come. Phillip Seybert holds a Bachelor of Science in Industrial Education from Central Michigan University and a Juri Doctor from Thomas M. Cooley Law School. Phil started his career as a college instructor in the Building Trades Program before joining a company specializing in single family home and apartment development. Prior to the founding of P.S. Equities, Inc. in 1991, Phil built up a wealth of construction and development experience by working several challenging positions simultaneously; Director of Development for a motel chain, VP of a development company and as partner in a real estate/development/management company. Mr. Seybert is highly regarded among the affordable housing industry and maintains his membership in the Michigan Bar Association, the Michigan Housing Council, is a licensed Real Estate Broker and Builder. Garrett Seybert holds a Bachelors degree from Ferris State University as well as a Real Estate Salespersons license from the State of Michigan. Garrett started very early on as a junior apprentice working at various multifamily sites painting and mowing. As the son of Phil Seybert and growing up around multifamily properties, Garrett has an inherent knowledge and interest of the industry. Being very mechanically inclined coupled with his "anything is possible" attitude, he brings a fresh prospective to the industry. 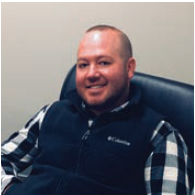 Garrett has worked on both sides of the business on the management side and the development side, giving him a broader perspective in finding solutions and making executive decisions. Garrett is a loving Husband and Father to twins, one boy and one girl; future industry leaders in the making!